The Journey Sequence 2007. Paintings and drawings exhibited at New Greenham Arts October 2007 and The Study Gallery of Modern Art, Poole May 2008. Between the beginning and the end there is only uncertainty. Oil and charcoal on canvas, 127 x304 cms. 2007. Yellow Meandering. Oil and charcoal on canvas. 100 x 120 cms. 2007. Private Collection, UK. Opposite ends of a possible path. Oil and charcoal on canvas, 122 x154 cms. 2007. Winner of the University of Bath Painting Prize, 2007. Collection the Univeristy of Bath, UK. Launch. Oil and charcoal on canvas, 90 x 140 cms. 2007. The Circular Walk. Acrylic and charcoal on canvas, 102 x 127 cms. 2007. The First Farewell. Oil and charcoal on canvas, 102 x 127 cms. 2007. Reconsidering Memories of Other Possibilities. Oil and charcoal on canvas. 154 x 183 cm. 2009. These are the paths we did not take. Gesso, oil and charcoal on canvas, 102 x 77 cms. 2008. Private Collection UK. There and Back. Acrylic oil and charcoal on canvas, 90 x 70 cms. 2006. Opposite ends of a possible path. Oil and charcoal on canvas, 122 x154 cms. 2007. Yellow Meandering. Oil and charcoal on canvas. 100 x 120 cms. 2007. These works are part of an ongoing body of work concerned with journeys. They are a multilayed record of an experience rather than a linear sequence describing one event. Although they may trace a movement through a specific landscape on a particular day, they are mappings of the mind as much as a record of physically moving through space. The building up of increasingly insistent webs of lines creates a spatial depth that suggests both distance travelled and time elapsing. The works on paper, with the marks rubbed back and laid bare, have a quietness about them, imparted by the apparent fragility of the pencil line, but the line also has a tensile strength that is insistent. The images stay in the mind. The generosity of scale of the canvases allows the lines to flow within the layers of paint imbuing them with a lyricism that suggests reverie. 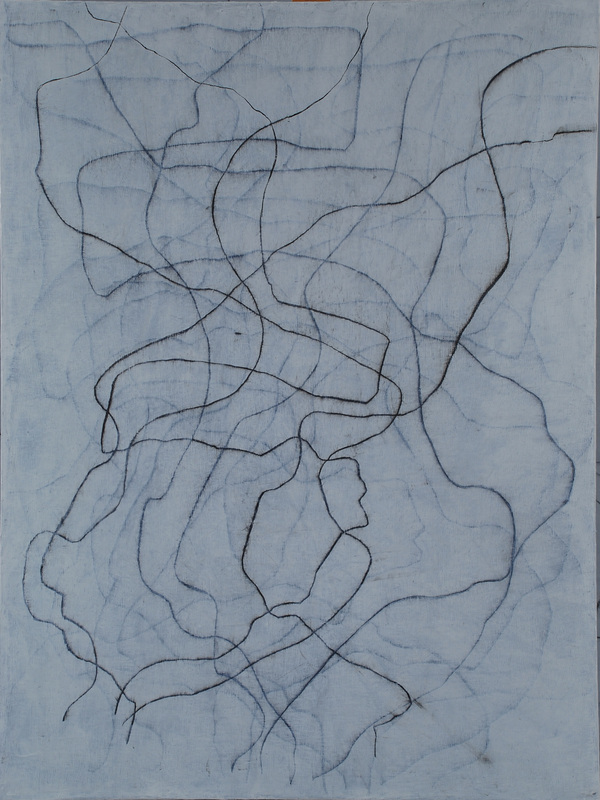 The process involves adjusting the memory, adjusting the line, allowing the formal requirements of the piece to take over from the initial free mark making, and then redrawing the route. Finally some parts of the image achieve a greater significance whilst preserving the faintest marks so that they stay in the mind like an unrecalled memory. Each piece of work records the progress of the drawing as well as tracing the route of the original walk. They are a sequence of remembering and forgetting. The earliest works, the 2005 Series and those commissioned for Trace in 2006, took as their starting point, walks done in Dorset and France which have been regular favourites over a number of years. Later paintings refer to particular events. Launch is the record of a journey on a particular day, but it was the culmination of a year spent travelling the length and breadth of the West Country in order to interview artists for the Fifty Wessex Artists book. Opposite Ends of a Possible Path became about possibilities. A record of the memory of a walk over the hills above Upwey near Weymouth, it had been done many times but the painting specifically acknowledges that each time it is different. 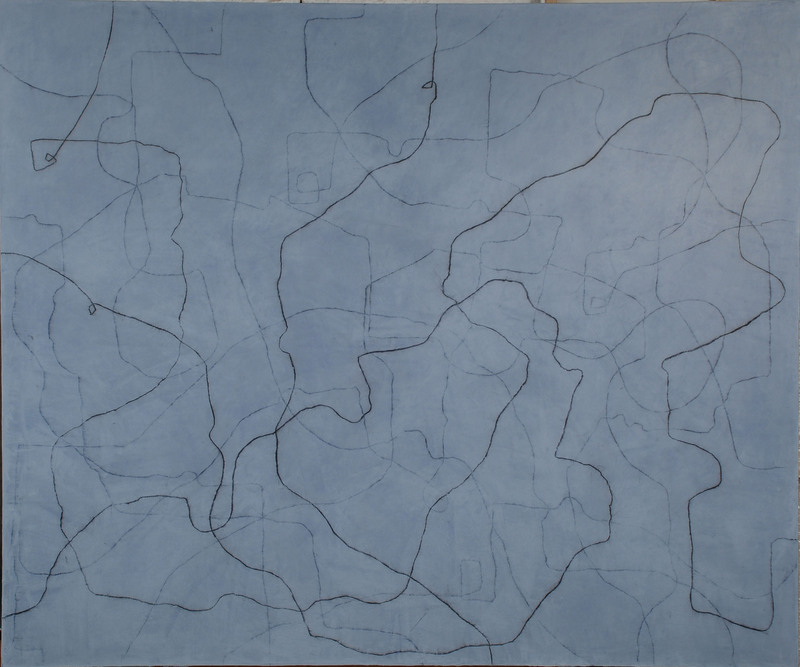 The lines are infinite variations of the route taken, preserved in a film of paint. It is about how memory fades as time elapses. In the painting the physicality of the line pales becoming a distant echo of earlier layers. Because of the organisation of space within the painting the route appears to change as the viewers move from one position to another. The work embraces the idea of mutability and variation. In it’s combining of paint and charcoal it deliberately overlaps the techniques of painting and drawing. The Circular Walk series refers to a walk accompanying a fellow artist on a route of her choice across the moor land of West Penwith between the parishes of Morvah and Madron. We started near Bosullow, walked up and over Watch Croft, joined the footpath to Nine Maidens Stone Circle, more accurately, the Boskednan Stone Circle and back to the beginning. Walking around stone circles within a circular walk became a series of circles within circles. Between the beginning and the end there is only uncertainty, explores the idea that nothing repeated can ever be the same. Any journey, however great, however small, has two certainties, a beginning and an end; it is what happens in between that has potential.